Beer: The beer offered here is good in that Hess offers a good variety of full bodied beers. I would recommend them as a good place to taste, but they still need to focus on a "flag-ship" beer that they make. They offer some unique flavors like in their Vienna Creme Ale, which offers a sweet cream finish like found in an irish creme soda. Their IPA and other beers are good but nothing to specifically note. Atmosphere: This should change in feb 2013 when they open up a larger and better equipped facility. 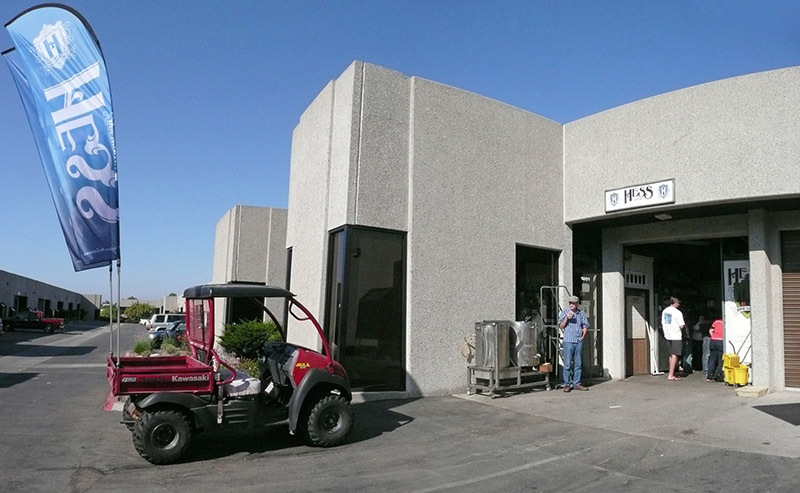 We tried their beer in an industrial double garage setting. I'm not turned off by this atmosphere because I believe some of the best beer is produced in garages all over America. This brewery has some potential and a name to look out for. Service: This brewery still has a very family feel and the service is top notch. This brewery is worth visiting, but they have yet to offer something in stores that you would pick over some of the more unique and standout breweries. Hess Brewing is a nano-brewery hidden at the back of a light industrial/warehouse park (lots of units but each is fairly small). We had a hard time finding it until we saw the dune buggy displaying Hess flags out front. The space is narrow with a roll-up garage door entrance and a very high unfinished ceiling with a single skylight. The brewing equipment looks like a somewhat large-ish home-brew scale (i.e., very small for a production brewery). On one side of the room, grain bags are stacked up to the ceiling on shelves. On the other side is a small shuffleboard table below shelves of empty kegs. Various souvenir t-shirts sporting logos of Hess beers hang on the walls and provide some colorful decoration. A fairly small stainless steel refrigeration unit is in a corner near the back of the space. 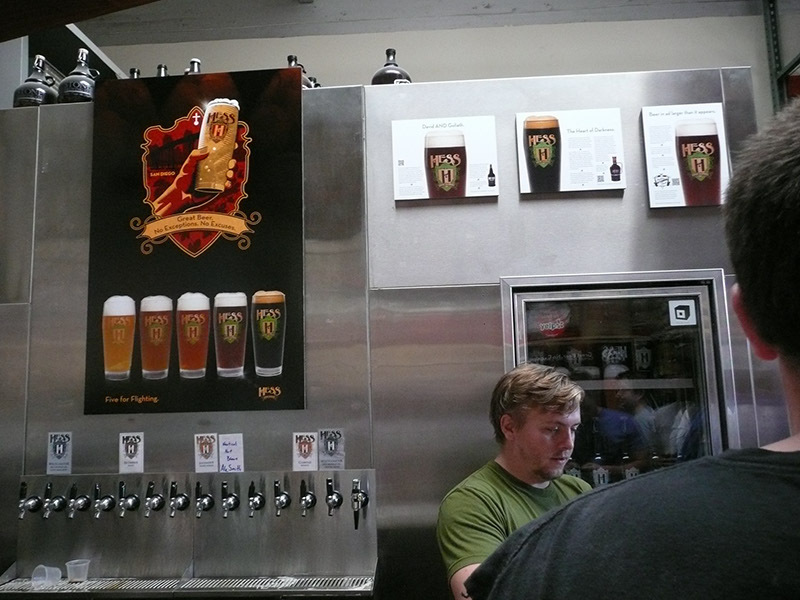 It cools the kegs that serve the tasting room and the serving taps are mounted in a group on its exterior wall. 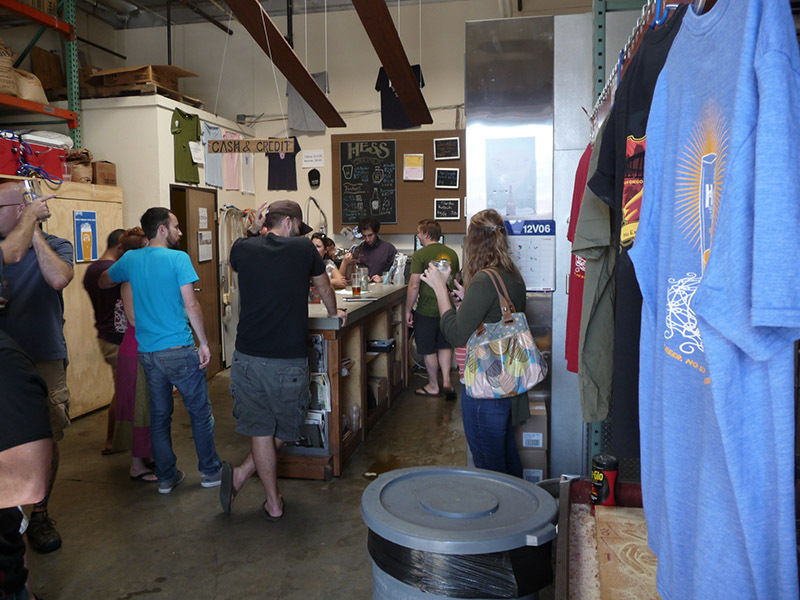 There is a small concrete-topped wood bar by the taps but otherwise there are no tables, no seating, and nowhere to rest your plastic cup, except for the bar. Beer is served in pints or tasters and you can fill a growler to go. There were five Hess brews on tap on our visit (Jucundus Orange Honey Wheat, Claritas Kolsch, Ex Umbris Rye Imperial Stout, and two different wet hop versions of West Coaster IPA) plus a Nut Brown ale from AleSmith. 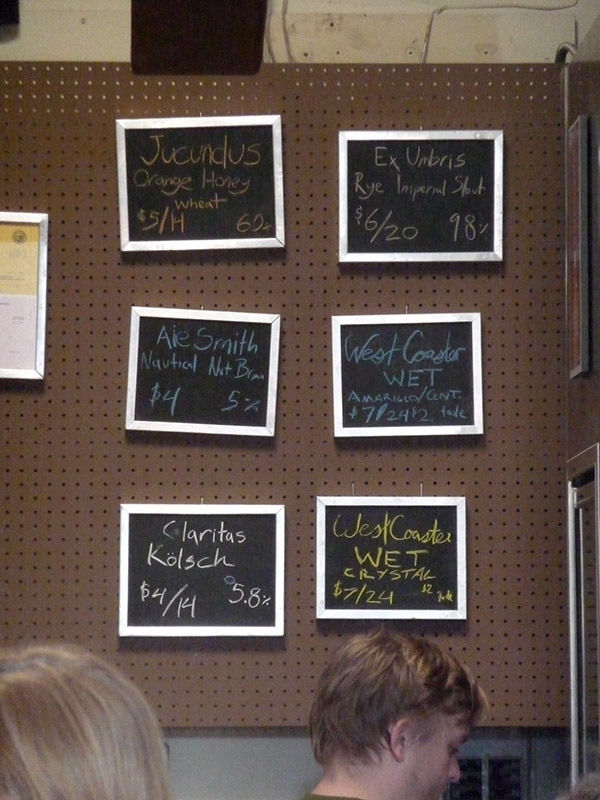 The amarillo/centennial wet hop IPA we tasted was quite good.